X-Large (4-6) - $48.99 Only 8 left! Oh, how sweet and adorable a puppy is; fluffy, floppy, wide-eyed, nibbly, slightly off balance, excitable, and with that intoxicating puppy breath! Oh how you long to have a little pooch to nip at your toes and bound across your lawn. But...your landlord says no pets. Sigh. Of course, your toddler is just as cute...not to mention (slightly) better behaved. 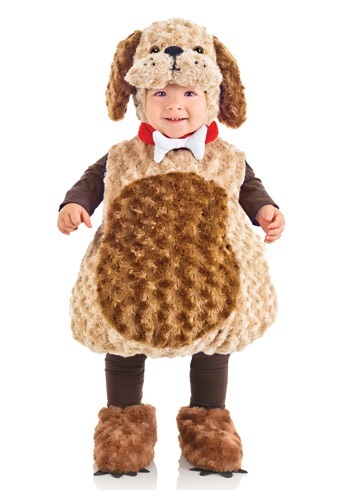 So why not feed one bird with two seeds, as they say, and dress your little one in this Toddler Puppy Costume this Halloween? We guarantee that your kiddo will absolutely adore getting to dress up like the family pup. After all, crawling, yipping, romping, and playing in the mud are all very puppy-like things to do, and they just happen to be your little one’s favorite activities, too! Also, puppies get rewarded with treats, and what toddler doesn’t love that? The best part is, your landlord will be none the wiser that you have become the proud owner of a sweet little brown, furry pooch all your own--it’s a perfect solution! Of course, it doesn’t hurt that your little one will rake in tons of Halloween candy when dressed in this cozy plush tunic with its matching puppy hood and shoe covers. It doesn’t matter how much that doggy in the window is, because you have just about all the cuteness you can handle right here!